What was the impetus to support parents in Workforce Training Academies? It actually started with our college president, Dr. Erika Endrijonas! LAVC is so lucky to have a president who looks at all our students holistically – she thinks about their lives outside of academics and how that can determine their college success. In October of 2016, we were at an Aspen Institute Ascend event, ThinkXChange, where innovative ideas and models to move families forward are shared with our Network. A presentation sparked her visionary thinking, and by the time it was over, she had connected the college’s FRC and Workforce Training (WFT) Departments by way of an email introduction with the edict, “figure out how to work together…it’s good for families!” Basically, Dr. Endrijonas asked us to use what we’ve learned about student parents, and apply it to people who are going through workforce training academies. How did you implement activities between the two departments? We were extremely excited to make this happen! Our first task was for the two departments to get to know each other and understand each other’s offerings for the purpose of identifying gaps in services. The major gap that we discovered is that student parents who were connected with FRC, did not receive enough help while preparing for, and gaining employment. We know we can do a better job of helping in this way. In addition, we learned that the staff in the WFT department often felt ill equipped to help participants sort out their family issues – often barriers to completing training programs. Issues such as: family stress, marital problems, children with special needs, housing insecurity, food insecurity, and general lack of knowledge regarding community resources left WFT staffing feeling at a loss as to how to help these folks. These issues posed very large barriers, often preventing participants from completing training, from searching for jobs and from retaining jobs. The FRC has been working with student parents for some time, and has developed strategies for supporting them during times of crisis. Although the problems, issues and barriers are viewed as global, each participant has his or her own unique set of challenges. We recognized that the clients of WFT might face some of the same challenges and barriers. Since this realization, the FRC and the Workforce Training Department have developed a strong collaboration through Strengthening Working Families (SWF). SWF addresses the need for supporting workforce-training participants holistically by assisting with family and mental health issues that are often roadblocks to success. Our first effort together was to pilot a 2Gen cohesive system to coordinate workforce-training academies imbedded with family support. How do you get people to use your services? There are a few different ways that people seek our services. As described above, we now recognize the importance of cross-referring. When someone seeks services in one department, we inform them of other services provided be other departments. We will even take it a step further and take them by the hand to walk through the different departments and offerings, ensuring there is full knowledge of the spectrum of services. How does the 2Gen philosophy work in WFT? Working backward from graduation, it is evident that the entire family is involved in the training process. Families are at graduation to celebrate their loved ones success, and they’ve also been there for the journey that took them there. We learned that when a participant shows up for training, they are including shadows of family members and personal lives. The success of the participant is tied closely to the well being of both participant and their families. This was evident at an academy graduation. One participant caught our eye…he seemed so proud when he was honored as a Veteran. He was with his wife and very young son who were cheering him on. Through our survey we subsequently found out this family had been homeless and that because they kept moving around; their son hadn’t received consistent services for his autism. The need to support workforce participants holistically was so clear. How could this man take care of his family and himself, and complete a demanding training…all at the same time? We later found out this man’s story was not so unique - 46% of participants going through workforce training have children. What are the common services you offer? We’ve embedded some family support concepts and services into all the academies. In the beginning of an academy, our mental health professional provides an overall introduction about our collaboration. She does a stress reduction workshop that includes strategies for everyday life and talks about all the FRC services they can use. Participants are then given a survey to indicate specific needs. What kind of individualized support do you offer? Once participants have filled out an initial survey- we can offer them individual assistance. Almost half of participants want visits with our mental health professional. From those individual meetings, each participant develops a plan. Because we know how important relationships are, we provide a “soft-handoff” to targeted community resources for continuous services. We also are committed to supporting WFT participants to transition into the college. We offer them a free college class upon completion of the Academy and individual academic advisement to enroll in college. When our departments started working together we envisioned workforce training participants having similar needs as our LAVC student parents. Actually they are very different groups of people with very different needs. Student parents have already began their journey of coming to college, which means many have the social capital to figure out how to get here. People who are going through workforce training academies have a different story. Many have experienced long-term unemployment and all the hardships that come with that, and their family lives have suffered. Since piloting SWF in June 2016, we have learned many lessons; most notably that participant’s family/mental health challenges are greater than we had anticipated. Balancing the competing demands of work and family can be a major contributor to time off, or even an exit from the program the workplace. Participants seem to have a lack of social support and knowledge about mental health and other community services so we need to help them make that connection. In addition, we need to continue our relationship and provide them with a personalized follow-up plan once they become employed. Sometimes keeping a job is as hard as getting it! Do you have a plan for next steps? Yes we do! 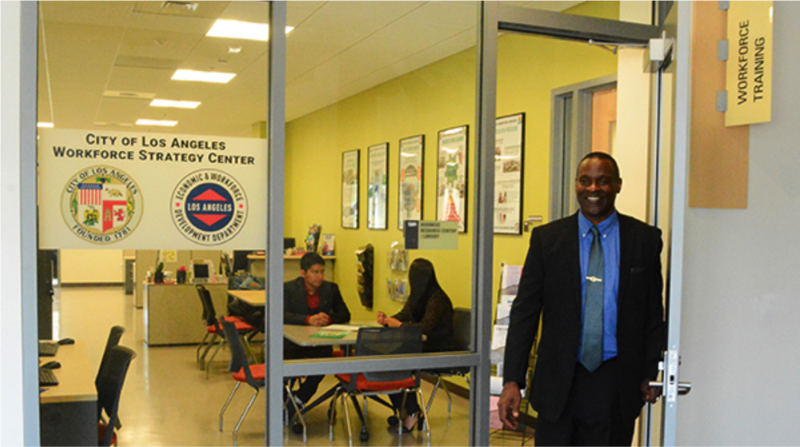 The LAVC Workforce Training Department has recently had the honor of designation as the City of Los Angeles Workforce Strategy Center, charged to work with the entire system of American Job Centers in LA. to pilot and share innovative workforce training programs. In this new capacity we will integrate Strengthening Working Families into the Strategy Center to create a new paradigm that will implement family/mental health support strategies throughout the LA City Workforce System. We intend to keep serving LAVC workforce participants with holistic services and our next step will be to use the lessons learned from the pilot, refine practices, and scale up the model. We plan to create a network that includes all WIOA funded America’s Job Centers (AJC) in the City of Los Angeles; supported by a strong partnership with targeted social service agency partners. This will create a new network in the City of Los Angeles that will embed holistic family support into all workforce-training academies. — Dakar Ivy, SWF Biotech Academy graduate, father of four children, and five years sober.